This is the ninth in a series of behind-the-scenes glimpses into the production of The Mechanics’ Institute Review Issue 14. Since March, we’ve been posting first-hand accounts by some of the people involved in the process, describing the stage in which they’re taking part, and their personal experience of it. 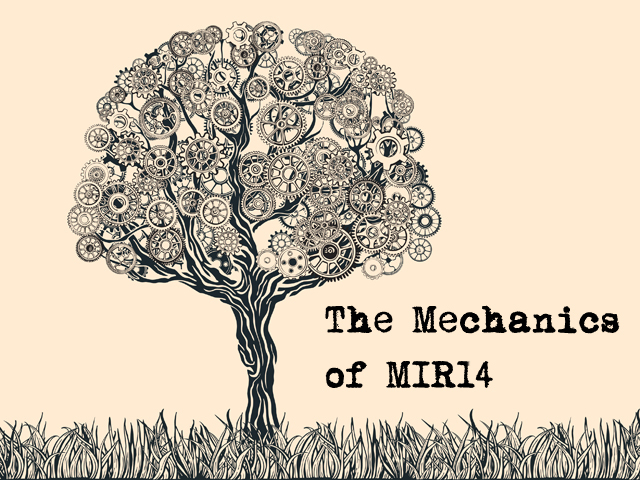 Our aim is to provide an insight into what publishing an issue of MIR entails, which we hope will be of interest to writers, readers and would-be editors alike. Each year we hold a series of readings events to help promote and sell the book. Post #9, by MIR14 author Elinor Johns, is about the experience of being a reader at the first of those events, MIRLive on 16 October. “My story’s been chosen!” I shrieked, dancing round the kitchen, freaking out the dog. Six months later, I was thrilled to receive my copy of this year’s Mechanics’ Institute Review anthology, a proper book with a svelte, black cover. I wanted all my friends to get a chance to caress it, even if they didn’t look inside, and I ordered a suitcase full of copies to shove through the letterboxes along my street. Personally, it didn’t take me long to devour these striking short stories by other writers (many of whom were already published) and I was proud to be included alongside them. Our wonderful editors gathered us together to talk about promoting the book. These days not even Elena Ferrante can get away with anonymity. We all accepted that we had to be prepared to read our work in public, and many of us attended a very helpful workshop to screw our courage to the sticking place. Then, I seized the chance to put into practice what I’d learned, when seven of us took to the stage at the Harrison pub in King’s Cross, at a MIRLive event. In truth, it was a benign audience that night, and we had nothing to fear. All we really needed to do was breathing techniques, as we’d been advised, and perhaps warm-up exercises for our mouths and jaws. I’d been yakking to my BFF for an hour and a half so I thought that was a pretty good warm-up. I’d dragged her into London needlessly early, forcing her to abandon her duties to her starving children. I knew that, as an aspiring writer herself, she’d have a much more fulfilling evening in the warmth and excitement of the darkened basement bar where we were waiting to showcase our work. “You’re first up,” she said and I downed my lime and soda in one. Immediately, I felt the bubbles fighting back and had a sudden fear that I’d get up under the spotlight and announce my story, called “Kissing”, with an enormous belch. To force up the gas, I began to attempt a self-administered Heimlich manoeuvre. “Calm down!” my BFF said, as I burped out of the corner of my mouth into my scarf, my foot tapping in time to the jabs at my solar plexus. Why was I worried? All my working life in the classroom, when I taught, I read stories; every lesson of every day was a shared performance. Yet, bring one adult into the mix and the sense of being judged begins to get to me and the fear of doing something inappropriate sets in. Those last few minutes before being introduced were the scary ones. I wondered if I would trip onto the stage, scattering beer glasses, and then develop Tourette’s once I got hold of the mic. Ever since I saw Casablanca as a child, if I get to be centre of attention, I feel the urge to raise my fist and shout “Vive la France!” It’s the same inexplicable desire that I get to throw my purse over a bridge or to climb on stage in the middle of a play in the West End. I like to think that I’m not alone in this and that we all have to repress these urges, thereby proving our sanity. Our host, Rebecca Rouillard, introduced me with a few lines of my uneventful bio. I wondered briefly if I should embellish it. In 1997 Elinor Johns was longlisted for the Man Booker . . . Would anyone bother to check that far back? Or at the very least, I could add: Elinor is a regular recipient of the Best Writer on the Lower Luton Road award (so what if it’s my kids who created that award – they’re very convincing and it’s a really long road). Suddenly, I found myself on stage without knowing how I’d got there, gaping like a fish. The mic was too high! I stood, helpless as a child yearning for an ice lolly held out of reach on a hot day in July, until Rebecca returned to the stage and slowly lowered the mic to allow for my stunted proportions and my sad lack of initiative. Then there it was, the microphone! Pointing at me, at last! All mine! I fought back the desire to launch into the Welsh national anthem – for a moment I thought I might get away with just belting out the chorus, as my story was set in Wales, after all. Then the madness passed and I planted my feet firmly as the workshop had advised and began to read, hoping only that I had chosen a good extract. Could I tap into the vast skills required for an eighth of my degree, in acting, awarded to me a mere thirty years ago? I hoped so. Could I evoke the sense of place, time and character in my story through pace and tone? Could I deliver the dialogue effectively without resorting to melodrama? Despite my best Catherine Zeta-Jones impression I was worried that I had butchered my story. After agonising over words and phrases in the editing process, I’d just blithely cut several out! I hoped my editors would not be peeved by the hatchet job I had done just to get in a juicy five-minute reading. The end of my extract came all too soon, in some ways. By the time I got to the last few paragraphs I had the confidence to look up. Myopically squinting at the blurred faces of my audience, I attempted to communicate the poignancy of my story. I was no longer afraid I would spit on the chap in the front row, or suffer a little leakage on the stage floor. I had delivered my story. At last, I could relax for the rest of the evening and I thoroughly enjoyed the excellent performances of my talented peers. I look forward to being part of the audience in the next set of readings, on November 17th at the Brick Lane Bookshop. When I got home at the end of that special evening, I felt so happy I couldn’t sleep. I had read the dénouement of a story, a story I had written myself, and that others had liked enough to champion for publication! My kids are delighted by the sight of my name in print. They have already made me a new award. They’ve stuck it in the window and the postman’s very impressed. He says I’m getting quite well-known now, on the Lower Luton Road.